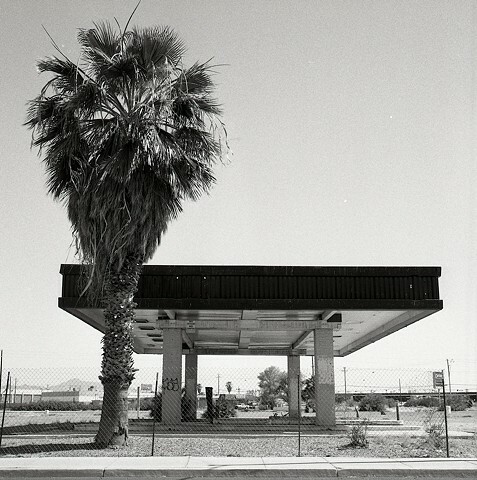 For my research, I sought to examine the visual implications of Las Vegas' economic struggles. Using large and medium format cameras, I captured a photographic record of the impact that Wall Street's bad gamble has had on a local economy based on gambling and excess. For two weeks in the June of 2013, I explored the neighborhoods, slums, and suburbs so frequently missed by visitors unwilling to venture off the strip. What exists outside the bubble of resort fees and all-you-can-eat buffets is a dying and empty city, to whom the phrases “economic recovery” and “market rally” are at best forlorn promises, and worst, savage affronts to the everyday middle-class burden of keeping a manufactured oasis from drying up. The bleak picture I set forth of course only applies to the lower and middle class neighborhoods of Las Vegas. Those who visit Spring Valley, Sun City, or any other number of upper class neighborhoods will see the well-watered golf courses, the well-visited shopping malls, and the well-cloistered, mansion-lined cul-de- sacs, and will not perceive an empty and dying city. Although I have referred to Las Vegas as an “empty and dying” place, this point needs some important clarification. Despite having mastered the first psychological stages of grief, these empty and dying places within and surrounding Las Vegas are not dead. My photographs do not merely record empty buildings and urban wastelands. Although these scenes are undoubtedly a part of the socio-economic and psychological landscape of Las Vegas (and a part of my photographic study), to focus entirely on the long dead instead of the dying is redundant and reductionist. Some parts of Las Vegas have a great deal in common with Nevada's numerous and seemingly ancient ghost towns. During my trip, I visited one such town, Rhyolite, which exists now as a set of crumbling foundations and a single park-sponsored latrine. Ruins, such as those found at Rhyolite, and even those more recently created in Old Las Vegas are important historical documents. However, my interest is not merely in static historical fact, but rather in the way in which the contemporary can evolve into the historical. For this reason, I expand my focus beyond the indulgent tragedy of death to the transformative process of dying. This process is apparent in the casual neglect of properties city-wide, in the gradual emptying of streets and in the hot desert sun&#700;s conspiracy with the dirt and the sand to reclaim forgotten spaces and scorch out their inhabitants. The only winner in this battle is the desert. Content in the displacement of well-watered lawns, the desert is free to prosper in peace. Its strategy is one of impatient reclamation. Having already been failed by the EPA, Las Vegas' desert no longer waits for obligated bureaucrats or enlightened middle-class twenty-somethings with equal doses wanderlust and smug entitlement to tend to its needs. Behaving opportunistically, as nature tends to do, the desert has taken advantage of its capitalistic colonizers' susceptibility to the gambler's conceit by reclaiming once-lively centers of commerce. It is within this framework of the desert's self-reclamation that I seek to engage with Robert Adams’ seminal photo book The New West. Published in 1974, The New West explores the great suburban subjugation of the Western landscape. Photographed in an objective and starkly unromantic mode, The New West contains black and white landscapes that favor the mundane over the sublime, including sprawling parking lots, unfinished subdivisions situated in mountain valleys, and the lonely silhouette of a woman visible through the window of an impossibly sterile and manicured home. What these scenes illustrate is the ugly side of the Modern Everyman's American dream, whose materialization comes at the cost of the natural landscape. Throughout The New West, Adams' images seem to implore: “this lifestyle is not sustainable: get out while you can.” My photographic study seeks to affirm Adams’ visual assertion of the flimsiness of manufactured landscapes. Forty years after the publication of The New West, my camera captured a bubble bursted. Over the course of time, Adams' imprudently optimistic Colorado subdivisions became my dying and dead Las Vegas neighborhoods. It is here that I seek to issue my own warning to gamblers, private and public, petty and high-stake: the bubble will continue to burst.